What’s all that Green Stuff on the water? The word “algae” comes from the Latin word for seaweeds. Algae have been on the earth for over 2 billion years! They can be tiny in size or giant, like sea kelp found in the ocean. The tiny algae can be so small that you can only see them through a microscope; the large sea kelp type can grow to 115 feet long– that’s almost as long as an NHL hockey rink! Algae can use the energy of sunlight to make their own food (carbohydrates) out of carbon dioxide and water by something called photosynthesis. All algae contain green-coloured “chlorophyll” so they can make their own food, but lots of algae have different colours as well. The simplest algae are single-celled organisms that float about in the water and absorb food through their cell walls. They can multiply and that’s when you may see a “mat” of that slimy green stuff at your shore. Some of these mats float onto rocks in quiet places where the motion of the water is not strong enough to carry them off again. They cling to the surface while the floating cells wave in the water, gather the food, bud, and spread into feathery, leaflike shapes. Algae can be good for the lake? Algae produce oxygen during the daytime, which provides oxygen to fish and other underwater insects, animals and plants. On the flip side, algae uses oxygen at night – too much algae can use up the oxygen in the water and that’s not good for fish and critters! “Hair” algae provides shelter for fish to lay their eggs. While algae can be good for the lake, too much is NOT so good. That’s when we start to see big mats of blue, green, white, black, red or brown algae forming on the surface of the water. 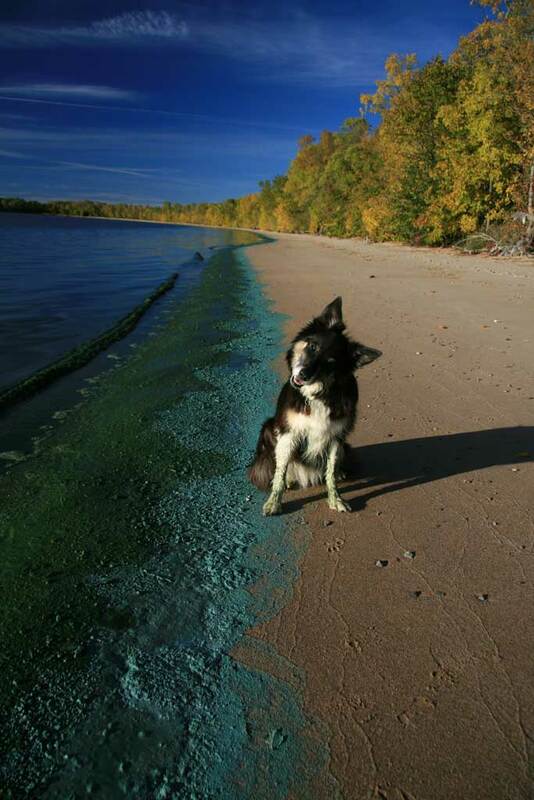 This can be very dangerous for pets and humans if they drink the water, especially the algae that is bluish-green in colour. How can there be too much? Algae mats can form when there is too much phosphorus in the lake – more than can be used up naturally by plants, fish and other critters. This extra phosphorus comes from rain that washes off city streets and farmland, water coming out of factories, mills and other industries, water coming out of cottage septic systems (when you flush the toilet, the water often goes into what’s called a “septic system” to clean it up before it runs downhill to the lake). Do you know that we sometimes put fertilizer on our lawns and gardens to make them grow bigger and faster? When that fertilizer runs off our yard and into the lake, we are helping to make the algae grow bigger and faster too – imagine algae on vitamins! Phosphorus is a chemical element that glows in the dark and in moist air. The name of the element comes from the Greek word phosphoros, meaning “light bearing.” (www.kids.britannica.com) Scientists use symbols to stand for the chemical elements. The symbol for phosphorus is P.
It is found in many rocks, minerals, plants, and animals and is also a very important element for plants, animals and humans – we need phosphorus to build teeth and bones. All living organisms use it to build their cells and to store and use energy. Phosphorus is also used to make chemicals that are used in many products, including toothpaste, detergents, and fertilizers. As temperatures warm up, algae can become more frequent in water because the water is warming up faster and staying warm longer during the year. This is called good “growing conditions” for algae. So, with global warming, there is a good chance we may see more algae and even see it on lakes that never had it before. Want to know more about climate change (also called “global warming”) and how to help slow it down? Lick Global Warming… the fun way! Check out this great website (www.lickglobalwarming.org) created by famous ice cream guys, Ben & Jerry. “Lick Global Warming” will help explain the effects of global warming on glaciers, oceans, weather patterns, plants and animals, along with other difficult to understand topics such as how global warming is impacting people around the world. For a fun way to learn more about what you can do to reduce carbon emissions, play the Lick Global Warming Memory Game.